Three main valleys Makiki, Mānoa and Pālolo are mauka of Waikīkī and through them their respective streams (and springs in Mānoa (Punahou and Kānewai)) watered the marshland below. Subsequent Kings and Queens visited and stayed in royal beach cottages in Waikīkī. Mid- and late-19th century Hawaiian royalty were prominent among the first of the new wave to permanently settle in Waikīkī. It was a place to escape to, as well as a pleasant location to entertain. In the 1890s, Waikīkī drew the elite who constructed Victorian mansions. Starting with James Campbell, Frank Hustace and WC Peacock, larger mansions began to be constructed in Waikīkī. The later homes of William Irwin (1899) and James Campbell (“Kainalu,” in 1899) epitomized the extravagance of luxury living. The wealthy discovered the ultimate destination of Waikīkī. Starting on a small scale, Waikīkī had a number of small residential tracks. In February 1895 a small subdivision (13-lots, each approximately 5,000-square feet in size) was developed makai of Waikīkī Road (Kalākaua Avenue) and mauka of the John ‘Ena Road intersection. Then, in 1897, a subdivision map for the Kekio tract was recorded. The Kekio Tract, shaped somewhat like a triangle, was bounded by Lili‘uokalani Avenue, Waikīkī Road (Kalākaua Avenue), Makee Road (Kapahulu Avenue) and the lands of Kāneloa (Thomas Jefferson Elementary School). As time went on, the royal estates were sold and subdivided on the dry areas of Waikīkī. In 1921 the former estates of James Campbell and George Beckley were offered to perspective buyers by developer Waterhouse Trust Company. With this subdivision the last of the large, readily-developable landholdings in Waikīkī had been broken up. Further residential development would have to wait for the drainage of the area by the Ala Wai Canal. Then, they started “land reclamation” projects on the coastal wetlands. With construction of the Ala Wai Canal, 625-acres of wetland were drained and filled and runoff was diverted away from Waikīkī beach. The completion of the Ala Wai Canal not only created the opportunity for the development of Waikīkī as Hawai‘i’s primary visitor destination, but also expanded the district’s potential for residential use. Before reclamation, assessed values for property were at about $500-per acre and the same property was reclaimed at ten cents per square foot, making a total cost of $4,350-per acre. The selling price after reclamation, $6,500 to $7,000-per acre, showed the financial benefit of the reclamation efforts. In 1924, the first post-canal residential venture, the McCarthy Subdivision, owned by and named for the Territory’s Governor McCarthy, was makai of what would become Ala Wai Boulevard. The property, roughly triangular in shape and widest on the Diamond Head side, was bisected by Lili‘uokalani, ‘Ōhua and Paoakalani Avenues. 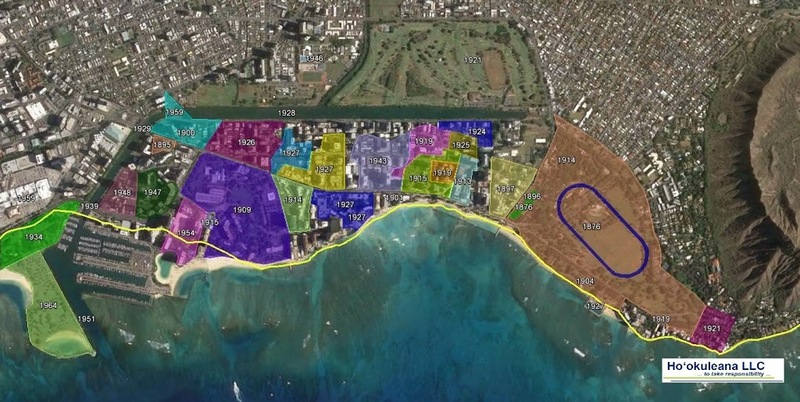 The mid- and late-1920s saw more and more of Waikīkī being subdivided into residential lots until most of the area was gridded into residential plots. Before and during this time of residential development, there were hotels. While these were part of the first hotel uses in the islands, as time went on, downtown Honolulu had the core of the hotel supply, and Waikīkī, two-miles away by foot over dirt roads, was not considered in the accommodation business. Sans Souci Hotel, a Waikīkī beachfront resort that opened in 1884 and offered private cottages and bathing facilities, turned it into an internationally-known resort after it hosted writer Robert Louis Stevenson, who wrote about staying there for five weeks in 1893. In the late-1890s, with additional steamships to Honolulu, the visitor arrivals to Oʻahu were increasing. When Hawaiʻi became a US territory (June 14, 1900,) it was drawing cruise ship travelers to the islands; they needed a place to stay. Hotels blossomed, including Waikīkī’s oldest surviving hotel, the Moana Hotel. Often called the “First Lady of Waikīkī,” the Moana Hotel has been a Hawaiʻi icon since its opening opened on March 11, 1901. By 1918, Hawai‘i had 8,000 visitors annually, and by the 1920s Matson Navigation Company ships were bringing an increasing number of wealthy visitors. This prompted a massive addition to the Moana. In 1918, two floors were added along with concrete wings on each side, doubling the size of the hotel. On February 1, 1927, the Royal Hawaiian (nicknamed The Pink Palace) was officially opened with the gala event of the decade. Over 1,200-guests were invited for the celebration that started at 6:30 pm and lasted until 2 am. Over the subsequent decades, promotional efforts grew and so did the number of visitors. 1955 saw the first of a new wave of hotel construction. Three high-rise hotels opened in Waikīkī that year: the Princess Kaʻiulani, the Reef Hotel and the Waikīkī Biltmore (which itself became a victim of progress and was imploded to make room for what is now the Hyatt Regency Waikīkī.) Another hotel – Henry Kaiser’s Hawaiian Village, which was not yet a high-rise, opened its first 70-rooms. Between 1950 and 1974, domestic and international visitor numbers shot up to more than 2-million from less than 50,000. Statehood and the arrival of jet-liner air travel brought unprecedented expansion and construction, in Waikīkī and across the Islands.